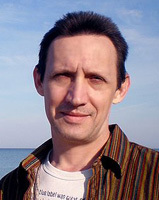 He was born on November 30, 1961 in Sevastopol. He graduated from the Black Sea Higher Naval Institute of Nakhimov in 1984. From 1984 to 1989 he served in the Black Sea Fleet. From 1989 to 1995 he served in the Pacific Fleet (Kamchatka). He retired in 1995. Since 1997, he began his professional career as a cartoonist and satirical writer.